Moving home, particularly to a new country can be a daunting experience. We are here to make it as easy as possible for you. Based just inside the South West corner of the M25 in Surrey and in South West France, halfway between Bordeaux and Toulouse. 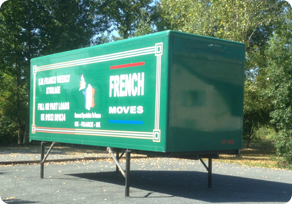 We are ideally located to offer a professional Removals to France and Removals to Spain and back to the UK. Our fleet of vehicles range from transit vans (for small collections and deliveries, or where access is especially tight) to ‘Road Trains’ with tail lifts and demountable bodies, suitable for the largest homes. On this web site you will find a guide to moving home including all the facts you need to know about how to pack, who to notify and how to get the best from your move. The volume of the consignment. Your timetable including moving out dates and required delivery date. Contact addresses and telephone numbers. With this information we can start to plan your move for you. If you need any guidance on specific items then the surveyor will be able to help. Please be sure to show him everything that is going and also point out all items which are not to be moved. For helpful tips read our Preparing to Move section.